The low growl of a diesel engine rumbles to life and then idles, the steady deep-throated purr of a cat. Footsteps echo across a dock, rubber on wood, followed by the metallic clang of cargo being loaded. The plaintive cry of a gull fills the air. We pull back the blinds to reveal a fog bank drifting down the Columbia River. Green bleeds to gray as the fog blots out the Astoria-Megler Bridge, turning it into a smudge that disappears into the ether. We wander down to the hotel lobby, bringing back steaming hot cups of a locally roasted coffee. Ray LaMontagne is playing on Spotify. We are waking up, too. The day is full of promise. Astoria has long been a favorite spot of ours, but we’d never actually stayed there. 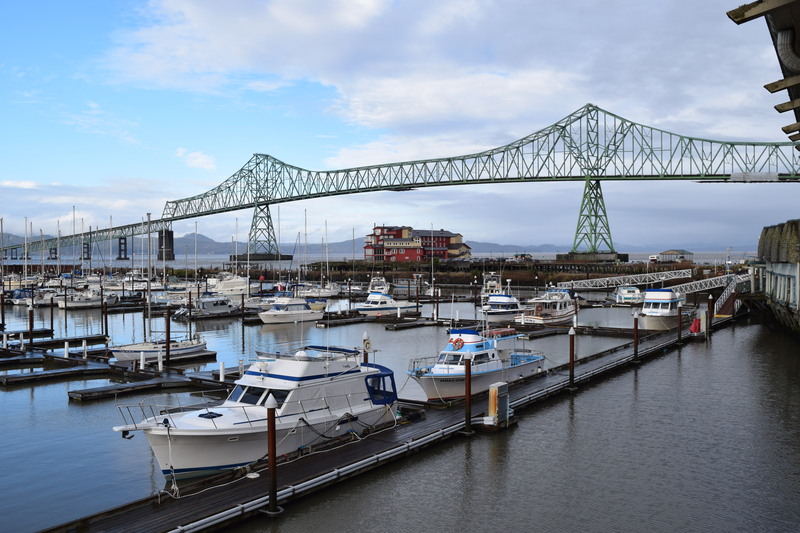 When we decided it was high time for a weekend getaway to the coast, our first inclination was to head down to Newport or Lincoln City as we usually do, but we found a good deal in Astoria and figured, why not? We’d originally planned on going last weekend, but the weather looked dicey – this is the winter where anything goes in Portland – so we ended up delaying our trip a week. Friday we worked a half-day, then hit the road around 1:00. The drive to Astoria was rainy, and the Columbia River was really high; some of the small towns we drove through on Highway 30 were practically flooded. Luckily, just as we pulled into town, the rain stopped and the clouds broke. Our hotel, situated right on the water, did not disappoint. I’d have loved to have taken advantage of the deck, but it’s just too cold in February to sit outside. So we drove into downtown Astoria and wandered around. Checked out a couple of stores, bought some fancy vinegars, nuts, and mustard from a Fancy Vinegar, Nuts, and Mustard store, and then ducked into Inferno, an upscale bar overlooking the river, for cocktails. The place was very Rat Pack-y, dark and clubby with Sinatra playing over the loudspeakers, and specializes in infused liquors. I tried a Manhattan with cherry vanilla whiskey, and followed that up with a pineapple tequila soda. Both drinks were smooth and delicious, as was Tara’s pear vodka press. We had a nice, relaxing time watching the cargo ships pass and the full moon rise. We were tempted to stay at Inferno, but there was a dive bar within walking distance of our hotel, and we didn’t want to worry about driving after we’d been drinking, so we headed over there for the rest of the evening. The Portway Tavern was everything a dive bar should be, and a few things it shouldn’t be (karaoke), but we had a great time. The drinks no-nonsense and got the job done, the food was pretty good – especially the chowder – and while we didn’t have a view of the river, we did get to hang out with the locals, which is always fun. Saturday was a lot of fun, too. After a lazy morning lounging around the room with Bloody Marys, we headed over to Pig ‘n Pancake for breakfast. We drove up to Long Beach, Washington next, and ended up walking six miles along the paved Discovery Trail that parallels the beach. We grabbed a late lunch at Castaway’s – chowder, steamer clams, and oyster shooters – as well as a couple of cocktails. 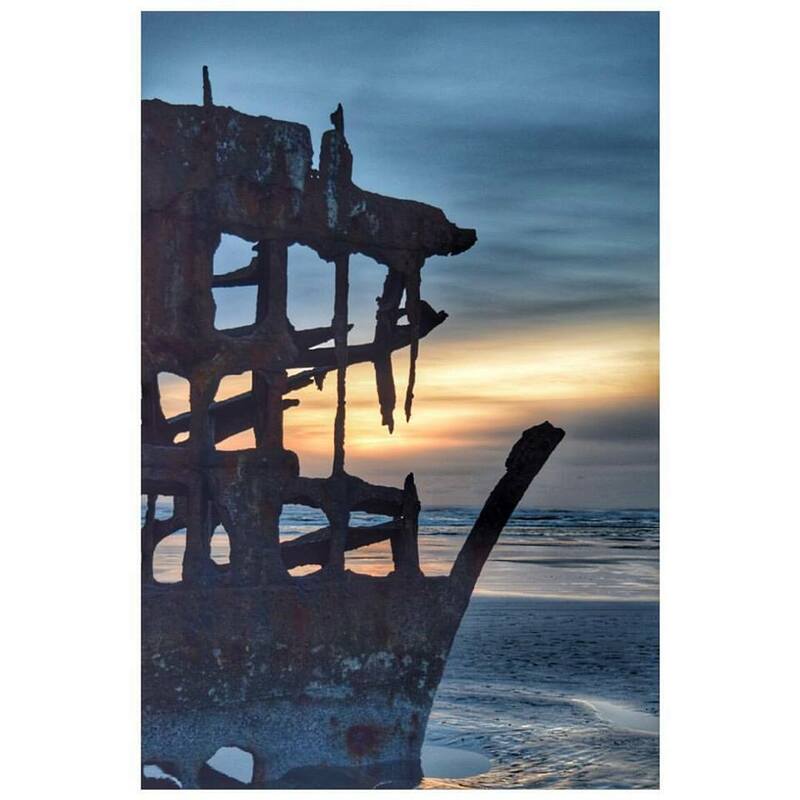 It was getting late now and we wanted to catch the sunset over by the Peter Iredale shipwreck in Fort Stevens, Oregon, so we drove over there next. Unfortunately, the sky was mostly overcast and there were quite a few people with the same idea, but despite the clouds I got a couple of pretty good shots. By now we were pretty exhausted. We’d been on the go all day, as evidenced by the 18,661 steps my Fitbit told me I took, so instead of a dinner out at a nice restaurant as originally planned, we kicked back in the room and ordered a pizza. We had a very chill evening listening to music, drinking, and reading. Who says you need to go out to have fun? Today we’re going to grab breakfast somewhere and then head home. We should be back by mid-afternoon. My fitbit would cry to report numbers like that. I loved how you opened this post by the way. 18K is a lot for me. One day last summer I did manage 25K, though. But I paid for it the next day both times. Mark, I LOVE the way you began this post! Your description was faaaaaaabulous and would make for a great opening for a book! Glad to hear you had such an enjoyable time! That final photograph is GORGEOUS! Well done, my friend! Seems like there’s less of the Peter Iredale every time I see it. Thanks, Dave. It’s been a good 15 years or so since I last visited the Peter Iredale, and you’re right. It’s wasting away. One of these days there will be nothing left, and that’s a shame. Elvis wears blue suede rubber shoes, of course. A gorgeous shot! Last Friday, a friend of mine showed me the picture book she made of her trip to the PNW last October. It included that shipwreck, which I found fascinating. So, imagine my surprise when you posted it on Insta two days later! It all sounds like a perfect long weekend. Safe travels! Weird coincidence! Like I just mentioned to Dave above, I haven’t visited the shipwreck in a very long time. But now that Tara and I have real cameras and a newfound appreciation for photography, it was a must-stop. It IS pretty cool that you can walk right up to it. A pig and a pancake? Good Lord a Mighty. The plates must be the size of the table.